While athenahealth has been a resident business in Watertown since 2005, we only purchased the property in 2013 from Harvard University. Shortly after, the Boston Globe published a story describing athenahealth’s vision for growing our presence on our new 29-acre home at the historic Watertown Arsenal. We immediately developed a 10 year plan that focuses on creating an open, permeable, and exciting campus for the community. The current conditions of the campus offer significant opportunities for community beautification and public activation for the once closed military installation. Our company has embraced an open planning process engaging neighborhood and community groups, town officials, and the business community in dozens of meetings over 2.5 years. Our campus plan aims to balance necessary company growth with community and ecological needs of the campus. We are focused on enhancing community connectivity through open space, circulation, and amenities that transform the property from its past as a private campus to a permeable inviting pedestrian-oriented public environment. Our plan maintains open space and expands it through landscape enhancements and an integrated and comprehensive stormwater management strategy. Please see our active projects below. Construction Blog Post # 7 – the end is in sight! 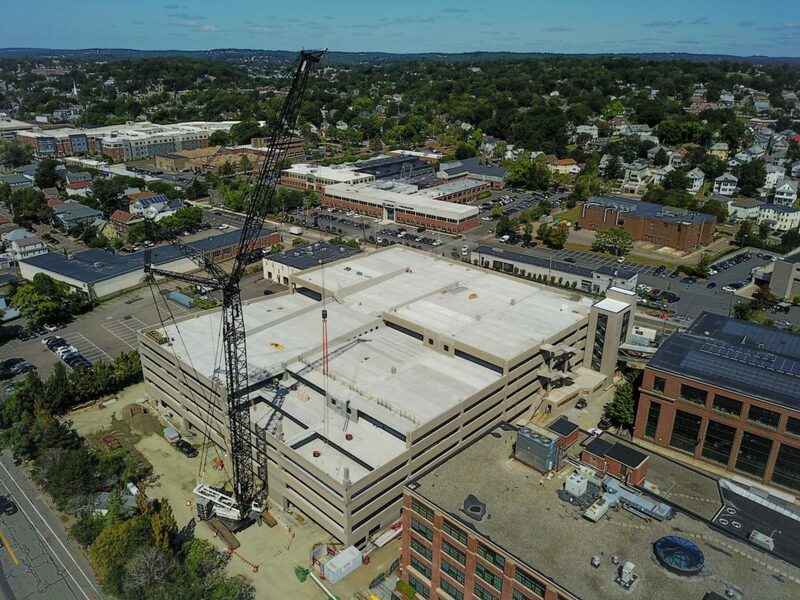 The West Garage project has continued to progress through 2017 and reached several major milestones. The precast structure has been completed, and the project continues to improve the surrounding site and utilities. The garage will visually develop further before the project is completed, aluminum screening and planters are to be installed. The project is targeted to be complete in early 2018. Questions can be directed to the project team by contacting garage@athenahealth.com. What to Expect: driving of the steel sheeting supporting the excavation, frequent soil hauling trucks to and from the site, large equipment excavating within the project site. What to Expect: lower frequency of soil hauling trucks to and from the site, large equipment excavating within the project site, periods of moderately frequent concrete trucks to and from the site. What to Expect: frequent deliveries of large precast concrete sections, deliveries of screen sections, moving erecting crane, underground utility installation. What to Expect: deliveries of screen sections, moving person lift. What to Expect: small crane activity, work trucks, low impact to neighborhood for these activities. What to Expect: Underground utility installations on the project site with some roadway connection, intersection improvements, site plantings. Drone photo captures the progress of the garage build as of mid-September. To enable access to the campus, the project will be working on improvements to the surrounding streets. 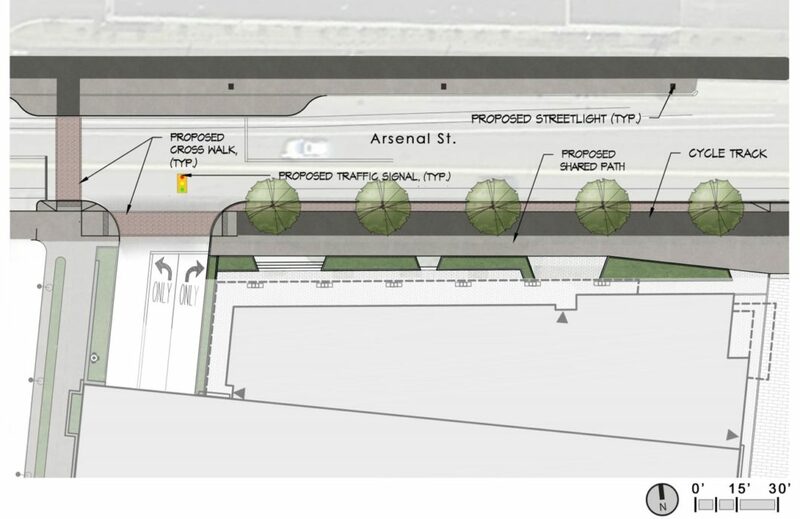 The two initial improvements will be on Arsenal Street at the original west entrance to the campus, and North Beacon Street at the intersection with Charles River Road. The existing entrance to campus will see a significant change and received a new signalized intersection. Today our vision for the future of this critical intersection onto The Arsenal campus includes upgrades as shown on the rendering plan below. 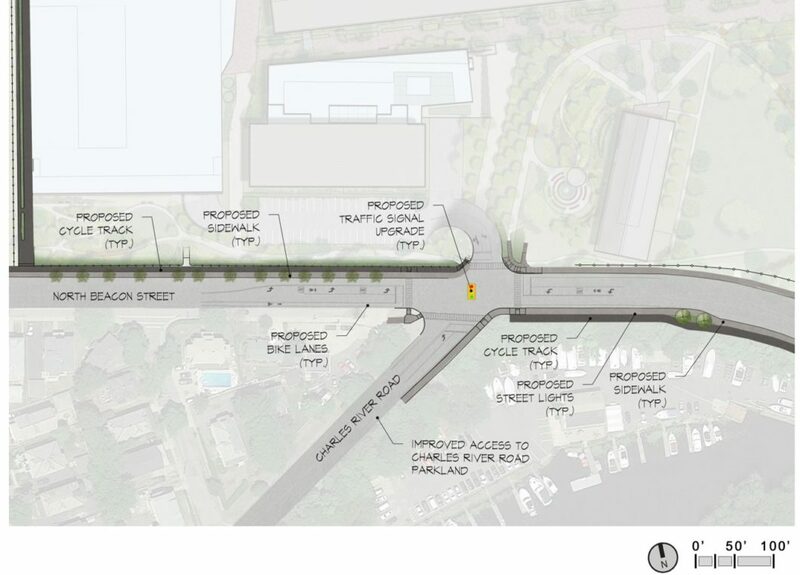 The proposed task list for the North Beacon Street and Charles River Road intersection includes a proposed cycle track and new sidewalk, an upgraded traffic signal, new bike lanes, new street lights, and an improved access to the Charles River Road parkland. The intersection of North Beacon Street, Charles River Road, and the entrance onto the Arsenal campus will have improvements to its traffic flow with lanes dedicated to shared street activity.